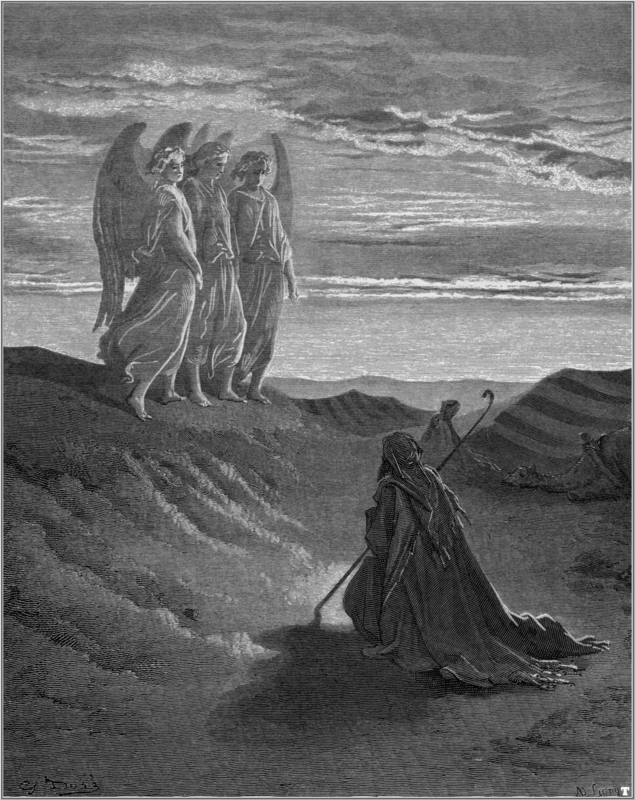 And he lift up his eyes and looked, and, lo, three men stood by him: and when he saw them, he ran to meet them from the tent door, and bowed himself toward the ground, And said, My Lord, if now I have found favour in thy sight, pass not away, I pray thee, from thy servant: Let a little water, I pray you, be fetched, and wash your feet, and rest yourselves under the tree: And I will fetch a morsel of bread, and comfort ye your hearts; after that ye shall pass on: for therefore are ye come to your servant. And they said, So do, as thou hast said. And Abraham hastened into the tent unto Sarah, and said, Make ready quickly three measures of fine meal, knead it, and make cakes upon the hearth. And Abraham ran unto the herd, and fetcht a calf tender and good, and gave it unto a young man; and he hasted to dress it. And he took butter, and milk, and the calf which he had dressed, and set it before them; and he stood by them under the tree, and they did eat (Genesis 18:2-8). Southerners are famous for their hospitality, so much so that the words are coupled together idiomatically in the phrase ‘Southern hospitality.’ Leaving aside potentially ironic implications of that expression (let us not forget that the ‘genteel’ South also maintained a bevvy of Jim Crow laws aimed at making life inordinately inhospitable for Southern Blacks), the concept of being a good host and treating those who arrive at one’s doorstep with dignity, warmth, and grace does have strong roots in American soil. Those roots are not exclusive to that soil, of course; the Ancient Greeks placed a tremendous value on the guest/host relationship, evidenced by numerous ancient writings and even the term the Greeks used for the practice of being a good guest/host, ghosti. Likewise, Hebraic culture values the right treatment of the stranger or alien in one’s land, as in the scriptural passages which launched this article, as well as dozens of other examples throughout the Bible. On American ground, however, this relationship found a variety of expressions among numerous peoples. While the performance of hospitality is inevitably different depending on its cultural context, the surprising homogeneity of value placed on hospitable action speaks to a core of humanity. The practice of hosting and honoring the unknown guest also appears in a number of folk narratives with a distinctively supernatural bent—hosting angels unwares, so to speak, although in some tales the beings hosted are decidedly non-angelic. In this article we shall see some examples of these supernatural interactions, the rewards and risks involved, and some potential interpretations of the practical application of unearthly hospitality. We will also look at some of the rituals and traditions surrounding hospitality towards mortal beings, which is where we shall begin our examination. In the Appalachian Mountains, traditions of hospitatlity are very strong, of course, but often mountain people might not see much of others except at major events. Being a good host extends to some of the most private moments in life, including the first night of marriage. The concept of a spontaneous wedding reception, called an ‘infare’ can be summed up thusly: ‘The word infare comes from Old English: in plus faran, to go in. It was a reception held in the home of the newly-married couple. Word was ‘spread around;’ no invitations wer issued, but people in the community knew that they were invited. Refreshments were served and games were played very much as at the play-party [essentially a bridal shower]. Neighbors often brought gifts of food and other things to be used in the home of the newly-wed couple’ (Gainer 32-33). The infare is a concept similar to the charivari or shivaree, which involved friends and neighbors of the newlyweds waking them the morning after with banging pots and pans, bells, whistles, hoots, and a number of innuendos about the wedding night. The function of these hospitality rites centers on a few concepts: celebration of a new union, blessing the happy couple, and community integration. An old lady in St. Francisville sold her cookstove to a man who promised to pay her funeral expenses instead of giving her the price of the stove in ready cash. He didn’t do as he promised. Every time his wife tried to get a meal and cook on the stove, the stove lids would fly off. So he went to the priest and told him about it. “Have you made any promises lately?” asked the priest. Then the man had to confess that he had promised to pay the old woman’s funeral expenses in return for the stove but that he hadn’t done it yet. Then the priest told him to go right away and pay off his debt as quickly as he could. So the man did this and after that he and his wife had no more trouble about being able to cook on the stove, and the stovelids never flew off again (Smith 50). This last example is essentially a haunting tale, although the aspect of returning a promised favor lets me slip it in edgewise to this look at hospitality. Weddings and ghosts aside, many examples of good housekeeping between the mundane and supernatural realms do follow the ‘angelic’ mode more closely. According to the Book of Mormon, Christ, upon his coming to the American continent, had twelve apostles. When it came time for him to leave, he asked them if there was any wish that he might give them. Nine of them asked to go with him. The other three remained silent. They were told that they would never suffer death. Since then they have roamed the earth in a sort of immortal state. They appear at frequent intervals to give aid to those in distress or to give advice. Mormon literature is full of accounts concerning the mysterious appearance of one of these men and the wonderful things that they have done…Oral versions can be heard in almost every Mormon community (Dorson 500-502). Dorson then recounts two different versions of the Three Nephites tale. In one, a sick brother is brought back from the brink of death on an isolated plot of land by a wandering stranger, who disappears almost the moment he leaves the house. Other Mormon tales include “The White Bread on the White Cloth,” in which an angelic visitor cures a sick baby from a hospitable household and “The Hungry Missionaries,” which tells the story of a pair of missionary Mormons near starvation who are gifted bread by a kindly stranger, only to find that their parents had given bread to a needy stranger that same night hundreds of miles away. Another version of the visitor tale that pops up frequently in Mormon lore involves the appearance of a “wee small voice” which provided emergency guidance in spiritually challenging situations. Some folklorists have equated the wandering Nephite tales with the tales of the “wandering Jew” found in some European legends (see Gustav Meyrink’s The Green Face for a fictionalized version). While the “wandering Jew” tales frequently bear at least a small amount of anti-Semitic language or tone, Jewish custom also has its own version of the guest, with the empty plate set for Elijah during holy meals. My wife and I adopted a similar custom after seeing Christmas Eve practices in Prague. Returning to the South, there are a few other places where strangers traveling in strange lands find succor among the locals. In Southern Protestant church circles, there are frequently tales of the wandering preacher being hosted by congregational family members, particularly for meals after Sunday service, often dining with a family while sharing extended prayers, blessings, and occasional sermons. Eventually, he becomes something of a comic character, giving rise to the popular proverb: “When the preacher come by for Sunday dinner it make[s] the chickens cry” (Courlander 500). In some versions, the preacher’s role can be turned into an abuse of power, even something evil or diabolical. Literary examples include Flannery O’Connor’s “Good Country People” and Randall Kennan’s Let the Dead Bury Their Dead. In addition to men (and occasionally women) of the cloth, African American communities put emphasis on the value of storytellers who would move between communities sharing lore and news. In this way, they were similar to a wandering bard figure, but more often the storytellers would be found in a centralized location (porch of a local mercantile—also becomes a literary figure, and a central piece of the narrative in Hurston’s Mules & Men). The traditions surrounding hospitality, whether Southern or more broadly interpreted, form a core piece of American cosmology. Since one never knows just who one is hosting, graciousness is always a wise decision. This entry was posted on May 8, 2014 at 9:30 am and is filed under History & Lore. You can subscribe via RSS 2.0 feed to this post's comments. Tell it to me plain, Doc. I aint a smart man. The Irish have similar stories and also have a tradition of hosting generously – maybe this has fed into America?